Autumn brings with it some wonderfully comforting flavors, and sweet potato is one of them. 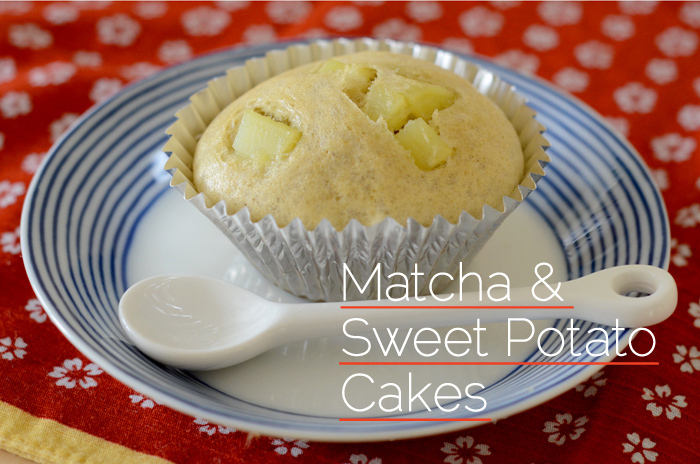 I love sweet potato just as it is, but we use them a lot in desserts in Japan and I felt like whipping up something sweet. Matcha(抹茶) is the Japanese name for green tea, and if you don’t add the green tea they can be enjoyed as brown sugar cakes, but I like the subtle fragrance and green color of the Matcha. 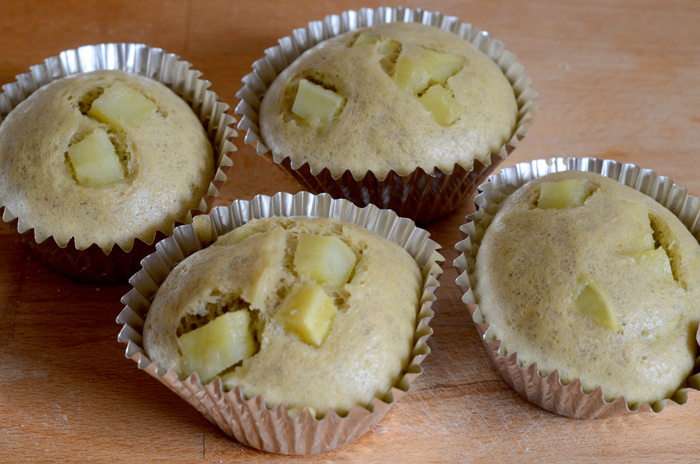 These cakes are steamed, not baked – which makes for a really quick and tasty treat. They are best warm, but they can be reheated in a steamer or microwave for a short time to regain their fluffy, pillow like texture! 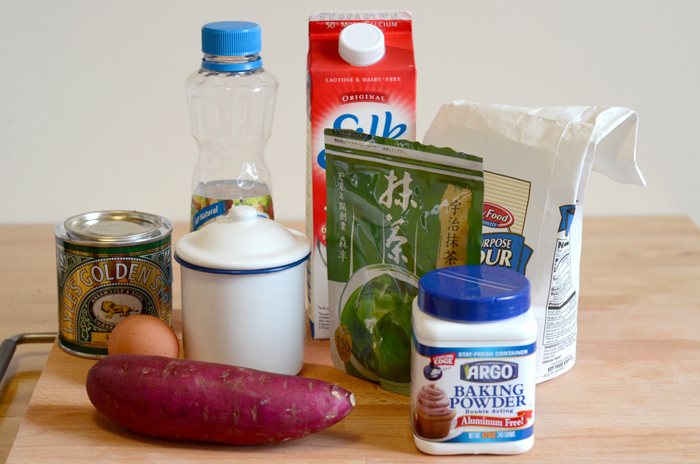 Here is everything I used – I used a red skinned sweet potato, but the brown skinned variety would be fine too. Feel free to substitute the golden syrup with honey or maple syrup. The green satchet is the Matcha powder I used. 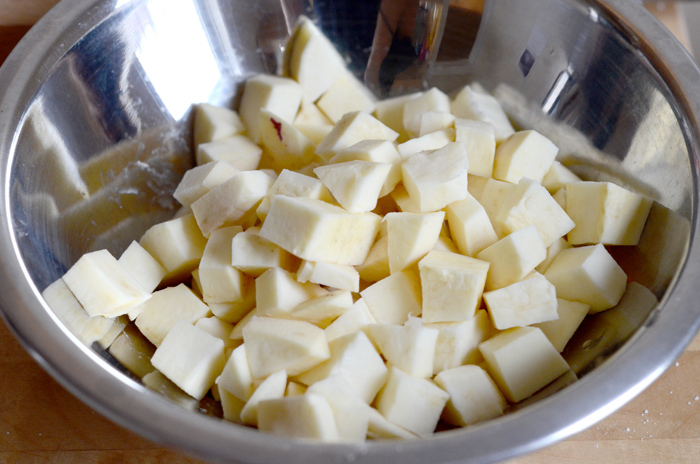 Cut sweet potato into small cubes, about 5mm each side. Keep in mind that they have to cook through in the 12 minutes they get steamed. 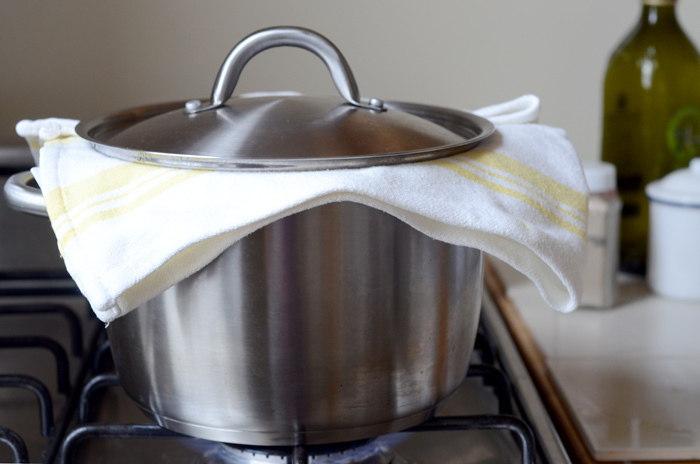 Put a large pot with 1 inch of water on the stove for steaming. 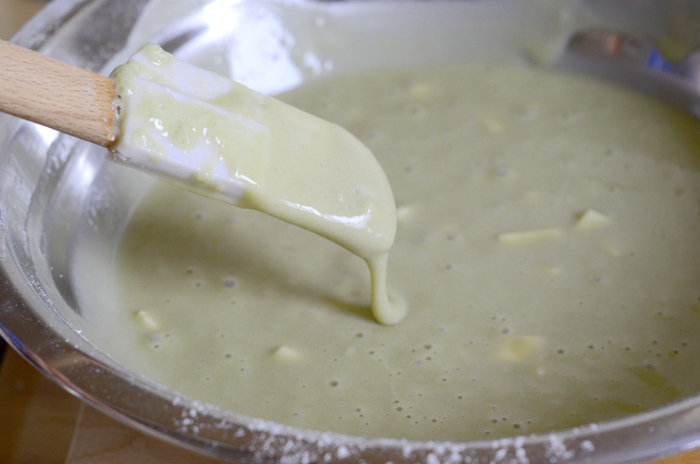 Sift together the flour, baking powder, and Matcha. 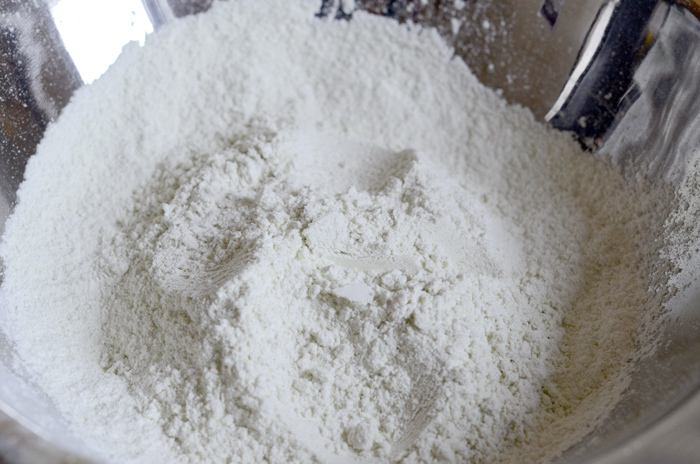 This ensures that there are no lumps in the flour and that the baking powder is well incorporated. In another bowl, cream together the egg and brown sugar until smooth. To this add golden syrup and oil, and mix well. Finally, add the soy milk. 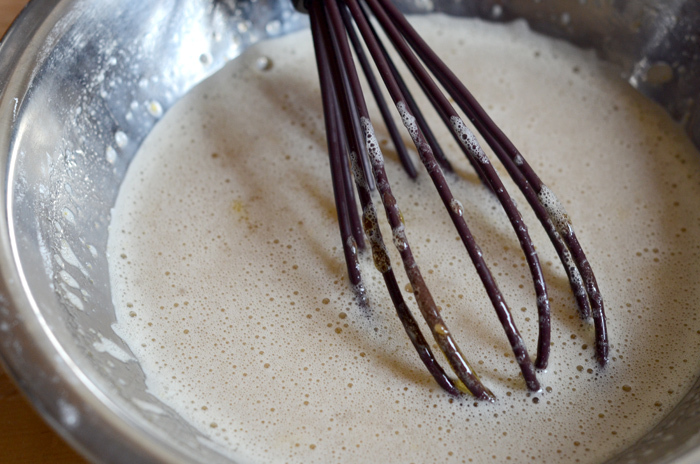 Combine the sifted mixture with the sugar mixture and mix well with an egg beater to ensure a smooth batter. Add half of the sweet potato cubes and reserve the rest to be placed on top of the cakes. 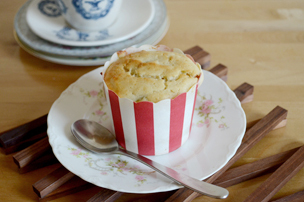 Using two tablespoons, fill the cupcake liners with the batter about 1cm from the top. I used foil cases, because the paper ones tend to be a bit too floppy under the moisture. 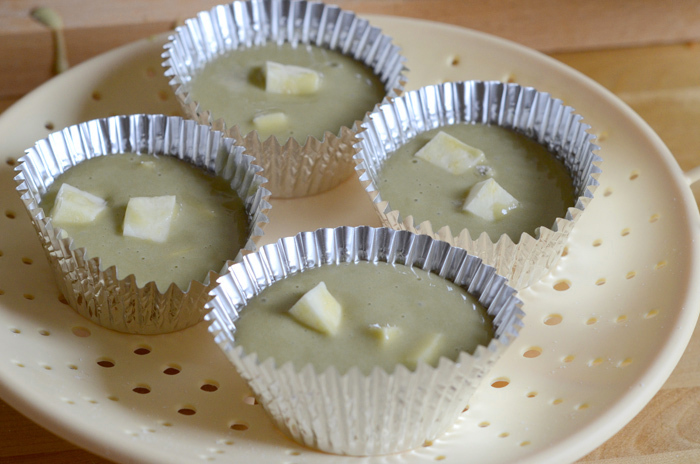 Place a few sweet potato cubes on the top of each cake. This silicon tray with handles is my steaming device, which is lowered carefully into the steaming pot. Here is my steaming apparatus, with a tea towel to soak up any droplets of water. 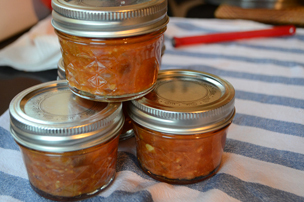 Please be very careful of scalding, and always turn off the heat before opening the lid. The cakes take between 10 and 15 minutes to steam, depending on the size. Mine took 12 minutes and I did two batches. Here they are, straight out of the steamer. These cakes would be great steamed in ramekins or ceramic bowls too, so that they keep their shape better. 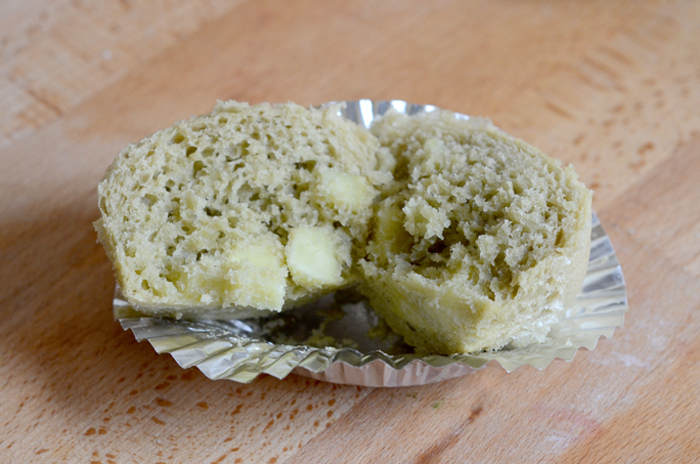 An interior shot of the texture of the cake – steaming produces a moist and fluffy, light cake. The sweet potato can be substituted with chestnuts, red beans or anything that pairs well with green tea.